" Mark Taylor. Keyboards and guitar. Born 3 January 1956 in Newcastle. The latest recruit has always played music for the excitement and creativity, and enjoys playing live the best. To Mark Simple Minds stands for a true spirit and passionate honesty in music. His first band was Oasis and he has played since for Lords Of The New Church, The Alarm, Sinead O'Conner, Lomax. He listens to and is influenced by Art Tatum, Thelonious Monk, Bill Payne, Dr. John. " " His ambition is to stay happy. A keen sport fan he likes to keep fit. Judging from his list of favourite films, his idea of heaven would be seeing Robert De Niro in a film by Martin Scorsese with George C. Scott and Jack Nicholson as support. Failing that, a copy of "The Lace Maker", "Fitzcarraldo", "Goodfellas", "Harvey" or "The Big Chill" would make a welcome gift. " 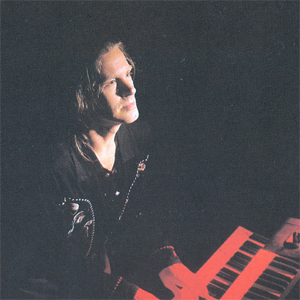 Mark was Simple Minds' live keyboard player for the 1990s. He was asked back into the band for the three Black And White Tours when Andy Gillespie was unavailable.